Jefferson had spent the years 1784-1789 in France, where an entire book of ice cream recipes was published in 1786 - Emy’s L'Art de bien faire les Glaces d 'Office. The first time I saw the frontispiece filled with activity – getting the ice from the icehouses, making the ice cream, going to serve the cups – I just had to laugh at the delightful image, while sitting in the LC Rare Book room. Still do. While in France, Jefferson wrote down several recipes, and one was for ice cream flavored with expensive vanilla. It called for 2 of bottles cream, 6 egg yolks, ½ lb. sugar and a stick of vanilla to be cooked over a fire, strained, poured into a Sabottiere and set in a bucket of ice and salt. After 7 minutes, turn the Sabottiere for 10 minutes, open and a spatula used to loosen ice from the sides. Repeated several times until the ice cream formed, then placed in moulds and pounded down solid. The mould was put back in the bucket and covered with ice. It was kept there until ready to serve, then immersed in warm water to release from the side of the mold. One of his first tasks as President in 1801, was to send to Philadelphia for two Frenchmen. His new chef, Honore Julien had served George Washington the last four months of his Presidency, in Philadelphia. After eight years of making memorable meals for President Jefferson in the new White House, Julien opened a confectionery and catering service in Washington City which also offered ice cream. Jefferson lived in the three Capital cities – New York City from 1789 to 1790 as Washington’s Secretary of State; and when the government moved to Philadelphia for ten years, he continued as GW’s Sec of State, then Vice President under John Adams. By the 1780s NYC had ice cream sold in shops, and Philadelphia of the 1790s was filled with French exiles from the revolutions in France and Haiti. The Washingtons often served ice cream, and had an extensive china ice cream serving set. British cookbooks also contained ice cream recipes in the 18th century. Among Jefferson’s books was The Compleat Confectioner… by Mary Eales. London: 1742, with instructions to make ice cream (recipe below) and several creams including chocolate, almond, and sego. They were initially in Mrs. Mary Eales's Receipts, Confectioner to her late Majesty Queen Anne, first printed in 1718. Extremely popular in Britain and America (where it was published in Alexandria, VA in 1804 and 1812), Hannah Glasse’s The Art of Cookery contained an ice cream recipe with apricots. Martha Washington owned a copy. 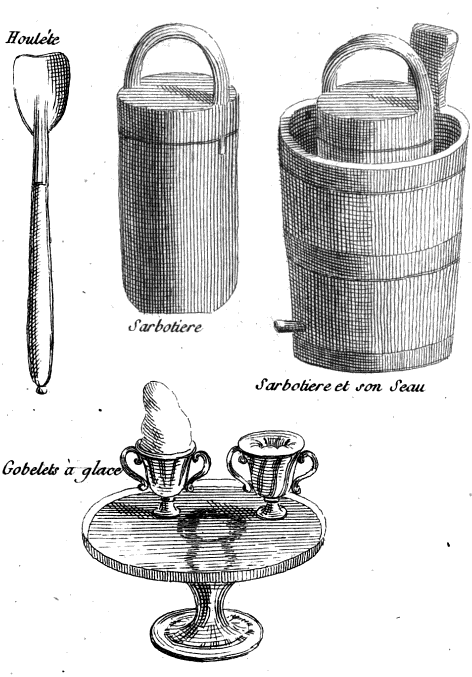 Jefferson had equipment to make and serve ice cream including an ice cream freezer and moulds. The pictures of equipment are from the Emy book, which came out in France while Jefferson was in France. The recipe written by Jefferson is from Library of Congress online. lay Ice and Salt between every Pot, that they may not touch; but the Ice must lie round them on every Side; lay a good deal of Ice on the Top, cover the Pail with Straw, set it in a Cellar where no Sun or Light comes, it will be froze in four Hours, but it may stand longer; than take it out just as you use it; hold it in your Hand and it will flip out. When you would freeze any Sort of Fruit, either Cherries, Rasberries, Currants, or Strawberries, fill your Tin-Pots with the Fruit, but as hollow as you can; put to them Lemmonade, made with Spring - Water and Lemmon-Juice sweeten'd; put enough in the Pots to make the Fruit hang together, and put them in Ice as you do Cream.